I have been working on a novel in which the main character is advised by his father to “protest with the blood”. Neither the father nor I know exactly what he means by “protest with the blood”, but it has prompted both of us to try and comprehend the nature and nurture of our DNA. I was at the Kilasch hospital in Godrej, India on a field trip to study sustainable practices in a small village. We were given a tour of the hospital which was designed with sustainability in mind. When we arrived at the phlebotomy lab, our tour guide, Pranav, told us that the hospital was dangerously low on blood donations. “Can I donate blood now?” I asked. I was brought into a room. I filled out the standard forms and stretched my arm over a blue armrest. A needle was inserted into a shy vein, which blushed as blood parted from its normal course and inhabited the slow, deeply-wheezing, plastic bag. Unlike any of my previous donations, this one was a bit of a spectacle. All of my students were outside of the door watching and two other teachers were with me in the room, along with 3 nurses. There was one thing I knew: My blood is not B+. It’s okay, I thought. At least your students are watching you do this. At least you have set some sort of example. I heard many of my students ask if they could donate blood as well, which for me was a victory, that is, if there was a victory to be had. As I sat there being milked, I questioned the potency of my nourishment. If an animal is stressed before it goes to slaughter, it can release hormones, which cause the carcass meat to be darker, firmer, and drier than normal. I wondered if there could be a gold panning processes in which the gravel, the hurt, pain, anxiety and depression that liquified into my veins could be gently agitated in water and disperse the more lustrous parts of my DNA. “Mr. Anthony, what’s the hardest thing that has fell on you?” A student asked. “Life, I replied.” Perhaps, my humor had gone dry too. I do not believe in Karma. Life is not consciousness enough of its intimacy with its readers to design authentic story lines; life is far to trite and the beginning and end is shamelessly predicable; and the plot is too fluid to be linear: life can be told sideways. But for some reason, ordained or not, I was in that chair, on that day, at that particular moment. But my blood isn’t just my blood. It’s half my mother; it’s half my father and 1/4th of each of my grandparents. It’s my friends, and my family. Inside of my blood are the relationships that elicit chemicals inside my body like serotonin, the bonding chemical. And if love were not a process, and were a thing, something tangible to be measured and counted like a chemical, then, that it is in my blood too. My blood is heavy with experience. After the blag became full of me, the needle was removed and I waited in a room next to the lobby. To call this room a waiting room would not give agency to the angst that occupied it. Why are waiting rooms called waiting rooms? Urgency room, anxiety room, or manic room would be a much better description. “Your blood is B+. We are going to process it and give her enough to last three days.” My hands trembled, and parts of my heart, parts that I forgot existed, begun to beat again. Ten minutes later, I met the father. His daughter’s name is Zoya. Even though he and I do not speak the same language, we shared the same moment. He showed me a picture of Zoya, and pointed out her hair. Her youthful hair, which was short, but full of life—full of childhood. Me, Zoya’s father, and uncle. I met Zoya, whose body was intruded with needles and other medical memorabilia associated with leukemia. She was crying when I entered her space. Her grandmother held her in her arms, and I watched Zoya’s meek and mild childish body fall into sleep. To describe what I was feeling would be futile. Watching leukemia wage war on a child’s body is an image that I do understand. Words can not describe it. Words are to definitive to describe the incomprehensible. I don’t know if Zoya will live to know the impact her life has had on mine. Had I not been in that chair, I may not have found reasons to be positive. I would not have remembered the love and support from family and friends and all the experiences that led me to that seat. 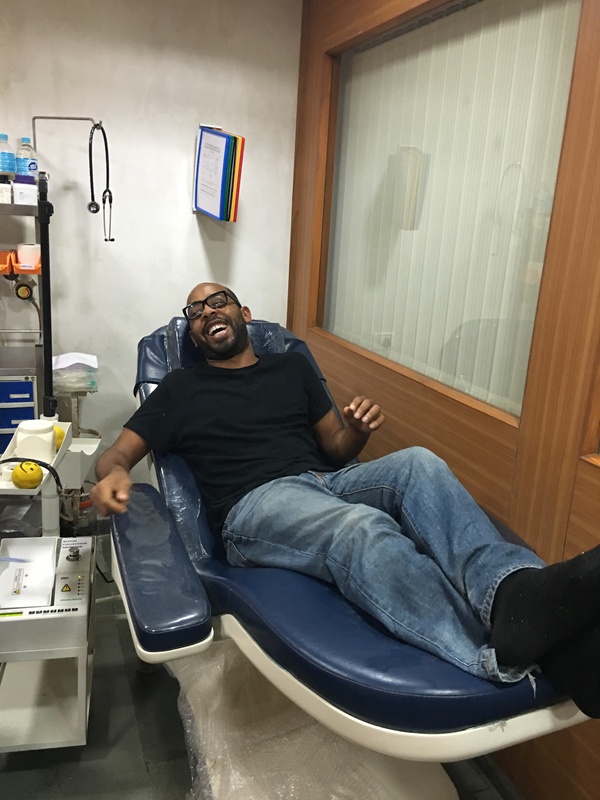 Had I not been in that chair, I would not have been able to donate blood to a child in need. If I hadn’t been in that chair, she would not have been able to save me. My blood will only last three days. Her impact on me will last forever. Zoya and me. Her father and grandmother are in the picture, but the image did not import correctly. I love this Anthony! As an oncology nurse, I especially appreciate your articulate words about the ravages of cancer on a young body. I can only imagine how much more challenging this must be in a developing country where resources are not as plentiful. Your gift of blood was indeed lifesaving for Zoya- there is no substitute! I do have one comment… You may want to amend your writing to reflect PHLEBOTOMY lab not Lobotomy lab… Small change, big difference 😉 hope all is well with you. Oh my gosh! I can’t believe I did not change that thanks for the catch! My fingers are just a hot mess today! I didn’t get to finish my comment: Thank you for reading the piece. You are right it is a challenge when resources are not available. I’m not sure if you saw what I wrote about the fuel crisis in Nepal, but it was a similar situation there. Being around all of this has certainly made me more appreciative (maybe more explicit about my appreciation) for the resources that I have. But real heroes are the nurses like you who do this work everyday. I’m not sure I am strong enough (I’m not sure if that is the word) to see that level of suffering. Thank you for the edit. I don’t know how I let that one slip, especially after telling myself I needed to make that switch when I started writing. That’s a lesson for the kiddos. I miss you guys!